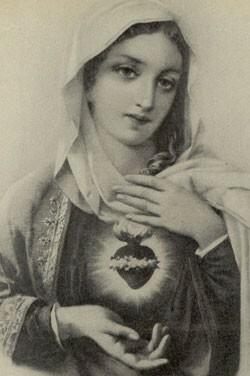 Subtitle: "Immaculate Heart Of Mary" is a Catholic doctrine that stresses the "perfections which God gave to Mary, the Blessed Virgin, and her holiness which is unique among men". Since Roman Catholicism teaches that Mary was conceived without sin Mary is Co-Redemptrix, equal with Jesus. "By the will of God, the most Blessed Virgin Mary was INSEPARABLY JOINED WITH CHRIST IN ACCOMPLISHING THE WORK OF MANS REDEMPTION so that our salvation flows from the love of Jesus Christ and His sufferings, intimately UNITED with the love and sorrows of His Mother." Pius says that it was "the will of God" that Jesus should NOT accomplish our salvation BY HIMSELF, but that our salvation comes from Jesus AND Mary. If that is true, it is only right and reasonable that we offer her our faith, worship and obedience, because without her, according to Pius, there is no salvation. If Jesus and Mary are "inseparably joined", it is also reasonable to conclude that when we worship Jesus, we automatically worship Mary. We have a contradiction here. Either Pope Pius XII is right, and Mary and Jesus BOTH purged our sins, or God is right, and there is only ONE name by which we are saved. It comes down to a choice of whether you believe man or God. I have to wonder, at what point did Rome actually think the true Mary of the Bible would say such a thing? Did they really believe that God had changed His mind and decided that Jesus dying on the cross was not sufficient, so He instituted devotion to the "Immaculate Heart of Mary"? Did they think that God forgot to tell us all about this doctrine in the Bible? This is pure, absolute nonsense! Acts 15:18 says, "Known unto God are all his works from the beginning of the world." This is crucial doctrine. How did it happen that God didnt mention any of it? Did they assume that God did not know how popular "His Mother" would become? A devil appears and says that God has changed His mind, and now wants to save mankind by devotion to Mary, and the Roman Catholic teaching authority had no idea that the devil was lying! Why would anyone trust their souls to men who cannot discern such a simple matter? "I want my entire Church to know that it is through the Immaculate Heart of My Mother that this favor is obtained, so that devotion to her Immaculate Heart may be placed ALONGSIDE DEVOTION TO MY SACRED HEART" (Ibid., p. 31). This subject should not be taken lightly by Christians, because the Catholics are claiming some serious doctrines, which cannot be found in Scripture. We are not talking about a few traditions that are copied from the pagans. We are talking DOCTRINE! We are talking about elevating devotion to Mary "alongside devotion" to Jesus! This is not Christianity! This is satanic! It is a cult! Pope John Paul II believes, "By dedicating ourselves the Heart of Mary, we discover a SURE WAY TO THE SACRED HEART OF JESUS" (Ibid., p. 289). Rome has continued to promote the worship of the "Immaculate Heart of Mary" despite the lack of scriptural support. All Rome has to lean on is her apparitions of "Mary" and "Jesus". The words of devils have become her final authority on the matter. Lets take a look at the doctrinal messages these devils have convinced Rome to wholly accept! In 1830, the "Virgin Mary" appeared to "St." Catherine Laboure at Rue du Bac, Paris. 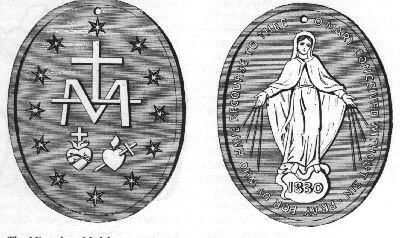 She commanded that a "Miraculous Medal" be engraved with her image crushing the serpents head on the front, and the two hearts on the back. According to "St." Catherine, an inner voice said, "These Two Hearts are formed together" (Call of the Ages, 249). It was after Paris that "Jesus" and "Mary" apparitions increased, each time giving even more glory to the "Immaculate Heart of Mary". 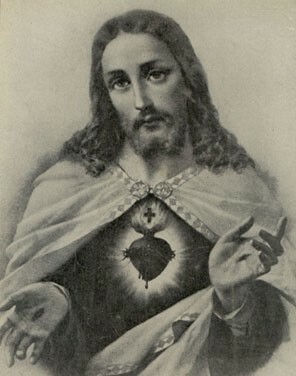 "This is the age of the Two Hearts All evil will be abolished by My Sacred Heart through My Mothers Immaculate Heart. Do not be afraid; for those who come to Our Hearts, a great reward awaits them. How I long for the world to be enfolded in Our Hearts. Our Hearts will triumph. Evil will no longer reign in the hearts of men. Man will love God and everyone will dwell in unity. This is how it will be my loved ones" ("Call of the Ages", Petrisko, p. 287). "This century many of you will see the reign of Our Two Hearts established on the earth. I am preparing you through the prayer groups and through the prophets who have been commissioned by the Father Almighty. Do not be afraid my children to believe in the Fathers ultimate plan of salvation. Many graces have poured out of my Immaculate Heart through the ages, and I continue to pour graces upon my children. I have come so that the Fathers plan of redemption will be fulfilled. I am the Mediatrix of All Graces, even for those who do not recognize me as their Mother and the Mother of God. Be not afraid to take part in the Fathers plan of salvation; to join in helping to co-redeem the world with me and my Son" (ibid., 288). "This is the hour of the Angelic Powers. It is the Angelic Powers who are guiding all my children in the decisive battle for the final defeat of Satan and the coming of the glorious reign of Christ, in the Triumph of my Immaculate Heart in the world" (Ibid., p. 283).
" O my Jesus, I offer this for the love of Thee, for the conversion of poor sinners, and in reparation for all the sins committed against the Immaculate Heart of Mary" (Ibid., p. 257). "Have compassion on the Heart of your most holy Mother, covered with thorns, with which ungrateful men pierce it at every moment, and THERE IS NO ONE TO MAKE AN ACT OF REPARATION TO REMOVE THEM" (Ibid., p. 258). Jesus died for the sins of the world. Why then is there no one to make an act of reparation? Why is this "Jesus" denying his own sacrifice as sufficient? Is it because it could not possibly be the true Jesus? The answer is simple. If the Catholic people would read the scriptures, they would know that Jesus is not a baby anymore. They would know that He grew up, died on the cross, rose from the dead and He now sits on His throne till His enemies be put at His feet! He is not floating around as a baby asking men to make reparation for the sins they commit against his mother! Nonetheless, the Roman Catholic hierarchy and her theologians continue to exalt the spirits of Fatima and teach others to do the same. "Look, my daughter, at my Heart, surrounded with thorns with which ungrateful men pierce it at every moment by their blasphemies and ingratitude. You at least try to console me and say that I promise to assist at the hour of death, with the graces necessary for salvation, all those who, on the first Saturday of five consecutive months, shall confess, receive Holy Communion, recite five decades of the Rosary, and keep me company for fifteen minutes while mediating on the mysteries of the Rosary, with the intention of MAKING REPARATION TO ME" (Ibid., p. 258). "Tell everybody that God gives graces through the Immaculate Heart of Mary. Tell them to ask graces from her, and that the Heart of Jesus wishes to be venerated together with the Immaculate Heart of Mary. Ask them to plead for peace from the Immaculate Heart of Mary, for the Lord has confided the peace of the world to her" (Ibid., p. 257-8). "There are many lost souls who need and want to return, yet, they do not know how. I ask all these souls to consecrate your hearts to my Immaculate Heart, that I may lead you and guide you to His love. Allow your heart to blend with mine that I may show you the beauty of Gods love in your life." "I, Gods Mercy, and My Immaculate Mother, the praying omnipotence, held back the hand of My Father, which was ready to strike a blow on the world, sunken in sin. My Father will have mercy on the world through the Immaculate Heart of My Mother. My children, you too will see the glorious arrival of My Immaculate Mother" (Ibid., 29). "...put into practice the words of My Mother who is appearing and imploring with tears at many places in the world in this urgent time. Tell everyone that accepting My Mothers words is the same as accepting Me and that holding her hands and following her is the shortcut to Me. The time of My Mother Marys victory is approaching. Make haste in repenting and get on board Marys Ark of Salvation. My Mother came into this world as the Heavenly Prophetess and My Helper who will lead you to My brilliant and glorious revelations. Follow her words. I will always be with you" (Ibid., 27). With such miraculous signs that follow these "messages from Jesus and Mary", it isn't hard to convince a Catholic that it must be from God. Many of them do not realize that Satan comes with lying signs and wonders. 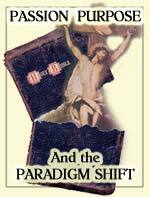 Peter claims that we have a "more sure word of prophecy" than the voice of God from heaven. We have the Word of God, which we do well to take heed to. Knowing then that Peter exalted the word of God above even the voice of God from heaven, you would think anyone claiming Peter as their head would follow his example. Yet, Rome would rather listen to the "voice of Mary" from heaven and exalt her words while diminishing the "more sure word of prophecy" found in the word of God! Roman Catholicism does teach another gospel, a gospel that she has received from devils. Rome has put the words of devils above the word of God. How then can Christian men and women still claim that Catholicism is "Christian"? "Her house is the way to hell, going down to the chambers of death."